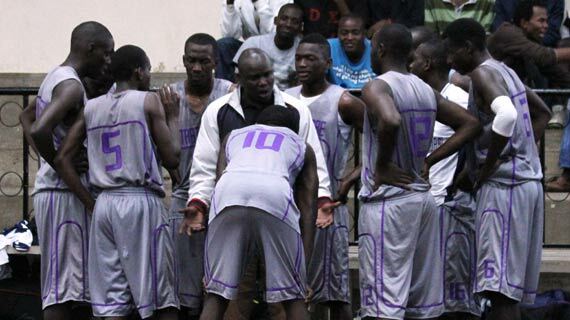 Kenya Basketball Federation (KBF) has reschedule the rained off premier league match pitting Strathmore University and Lions for Sunday at the Nyayo Stadium gymnasium. The match officials led by Justus Akhwesa shelved the Saturday game after the rains started leaking into the playing arena through the porous roof. At the time the gymnasium was rendered unfit for players’ and referees’ safety in court, the students were leading former national champions 21-17. Water falls streaming into the gymnasium worsened the situation forcing fans to clutch in certain sections of the hall so that they are not rained on. This has been the case for the last four years for basketball lovers. Moses Wanjara, Lions' assistant captain, just like last weekend is optimistic that his squad will triumph over the varsity side. "Both teams are good, full of talent but I'm optimistic that experience will win the game for us," said Wanjara. Player-Coach Juma Ikapian echoed Wanjara's sentiments saying his charges are in high spirits and well prepared to extend our nine-match unbeaten run. "The team set a target for themselves and I'm happy that they are psyched up to maintain the winning streak," reiterated Ikapian. On Saturday, Lions invites Blades- senior Strathmore line up- in a mouthwatering meeting at the Nyayo gymnasium. "We are taking a game at a time and right now we are focusing on our match against Blades then after we will look at the Sunday Strathmore fixture," added Ikapian. Both Blades and Strathmore are placed above Lions on the leader-board. The Strathmore sponsored teams are five points superior to Lions with 28 points sharing spoils in position four while Lions lies on the tenth position.